The aim: The purpose of this study is to verify and prove antimicrobial efficacy of two topical pharmaceutical finished products, a gel and a cream, with propolis hydro alcoholic extract 30% 1 and an antiviral synthesis used as active pharmaceuticals ingredients. These products are intended especially in the treatment of herpes or any of a group of viral diseases caused by herpes viruses, affecting the skin (often with blisters). Methods and Materials: The study of antimicrobial efficacy was performed in accordance with the provisions of the European Pharmacopoeia, 9th edition, version in force, method described in Chapter 5.1.3. Efficacy of antimicrobial preservation and acceptance criteria for preparations for cutaneous use2 and the specialty literature. The sample under study was forcedly contaminated with suspensions (105/mL) of Staphylococcus aureus, Pseudomonas aeruginosa, Candida albicans and Aspergillus brasiliensis and the times studied were 0, 2, 7, 14, 21, 28 days. Results: Acceptance criteria for antimicrobial efficacy are presented as a logarithmic reduction in the number of viable microorganisms, calculate the ratio between the number of UFC/ mL from baseline (T0) and the number of UFC/ mL determined for each test time and have been fully met. Conclusions: The pharmacopoeia requirements were entirely met for the gel product, and the cream did not prove efficacy on the Candida albicans microorganism. 1. Abbas H., Popescu V.C., Crisan I., Popa M., Chifiriuc M. C., Gradisteanu Pircalabioru G., Lupuliasa D., Farmacia, 2017, Antibacterial Efficiency of five propolis extract on planktonic and adherent microbial strains, Vol. 65, 5: 813-818, ISSN: 0014-8237 (for the Printed Edition) ISSN: 2065-0019 (for the On-Line Edition). 2. European Pharmacopoeia 9th ed. (2017), Strasbourg, FR: European Directorate for the Quality of Medicines. ISNAD POPESCU, Carmen Violeta , ABBAS, Hazem , MANEA, Stefan , IVOPOL, Lili , DUNE, Alina , POPINIUC, Candice , LUPULEASA, Dumitru . "Antimicrobial Efficacy of Some Products with Propolis Hydroalcoholic Extract 30% and Antiviral Synthesis". 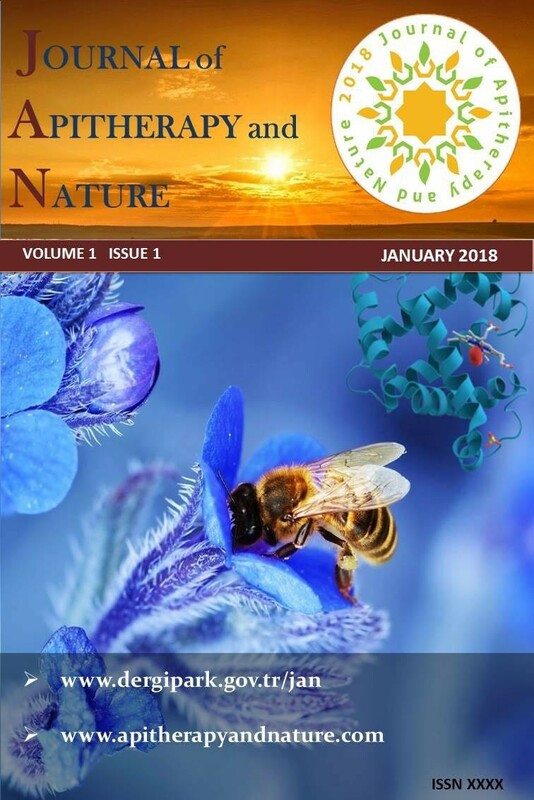 Journal of Apitherapy and Nature 1 / 3 (December 2018): 70-70.